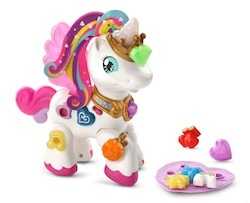 Kid-tested, parent-approved toys for kids of all abilities! 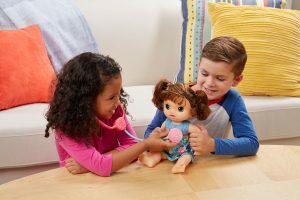 Selma’s Dolls introduce the beauty of differences through play. Via the storybook, parents can teach their children that differences are special and lead to friendship and understanding. And ultimately those differences lead to wonder and acceptance. Annie wears a blue and yellow butterfly dress pattern to represent awareness for people with Down syndrome. Lola wears a Mexican-inspired print that’s a nod to Alva-Ruiz’s heritage. And Ameena wears the color green, as green has a number of traditional associations and meanings in Islam. “The book is the same for all three dolls, but each individual doll is amazing!” says Emily. This Rubik’s Cube has been enhanced with embossed shapes. 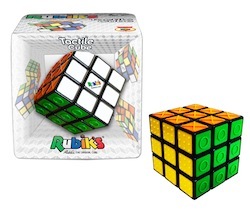 By adding shapes to the colored sides of the cube, the Rubik’s Tactile Cube is now playable (and solvable) for those with visual impairments. 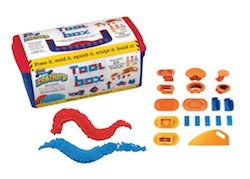 Developed by Hasbro and in collaboration with The Autism Project, ToyBox Tools is a collection of free resources for parents, teachers, and caregivers to help them engage children of all abilities in the joy of play. 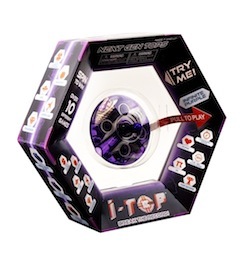 The program offers a series of wait cards, countdown timers, play-mats and playbooks with step-by-step instructions on how to play with several Hasbro brands such as Baby Alive, Transformers, My Little Pony, Playskool and Hasbro Gaming. During the holidays when so many toys are gifted and exchanged, the program offers structured guidance for kids who may need some support on how to play with them (individually and socially). Parents can turn to ToyBox Tools to select the right product and level of play appropriate for their child. 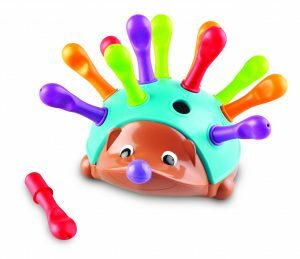 Little ones can take this toy on-the-go while they build up hand muscles and tune fine motor skills replacing the chunky, peg-shaped “quills” within the holes that dot the smiling hedgehog’s back. Spike’s colorful quills also lend themselves to lessons in counting, sorting, and color identification skills. Grab the microphone and use Music Magic mode to turn down the main vocal track of your favorite songs so you can be the star. Easily connect your MP3 player or mobile devices with the included audio cable and play favorite tunes from your own collection or sing along to the eight original songs. Twist the disco light 180 degrees for colorful light effects that create a great atmosphere for singing and dancing. “This toy encourages singing and communication, so it really helps my daughter with her receptive and expressive communication delay,” says April. 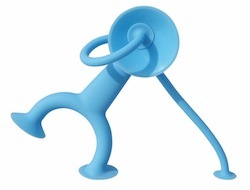 With suction cup head, hands and feet, and long stretchy arms, it connects to other Oogis and any smooth surface. Oogi leaves room for the imagination and invites children to explore and experiment while playfully training hand-eye coordination and fine motor skills. “Great for upper body and bilateral strengthening and the kids love the sound it makes when they pull it off a surface,” says Jacque. This mini sequin Dino is ready to cuddle, calm and comfort. This super soft dino plush toy offers hours of sensory play with reversible colored sequins that provide both visual and tactile benefits. 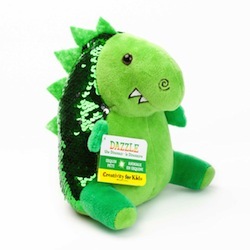 Dazzle the Dinosaur is a weighted plush companion to take with you wherever you go. “This toy serves multiple purposes: stuffed animal, tactile sensory and weighted,” says Sabrina. This set is a small wonder of playful design, with features and functions that your child will love. All family members fit in this caravan toy when it’s time to go. The canoe fits neatly on top of the car – and even has room for the dog when you paddle off. “Helps with fine motor and play skills,” says Rebeca. 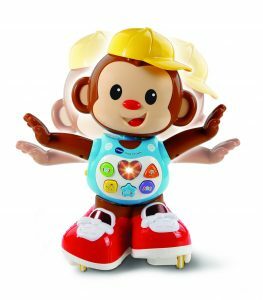 Chase Me Casey is an adorable little monkey that skates, spins and wobbles across the floor, encouraging your little one to dance and crawl after him. When your child gets close, Casey reacts with playful sounds and silly and encouraging phrases. Five colorful shape buttons on the playful monkey’s shirt introduce letters, numbers, body parts, music and more. 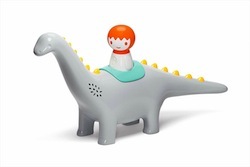 “Kids love that it moves and sings,” says Meghann. 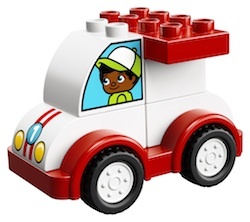 Little racing drivers will love to build and rebuild this set for endless driving fun. It’s simple for children to build, developing fine motor and early construction skills, and it’s a fun toy to take along and play with wherever you go. “Kids use fine motor building skills to put it together. We love the bright colors and it rolls fast,” says Rebeca. 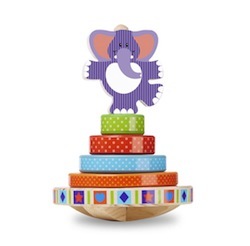 Sort, stack, and rock six brightly colored wooden pieces, including a topsy-turvy elephant. A sturdy wooden stacking rod sits on a curved base that rocks and spins. They will delight in sorting and balancing pieces with developing fine motor skills and hand-eye coordination through imaginative play. 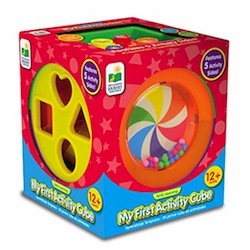 “Great for fine motor skills and a fun way to teach colors and circle shape. Although it is made to rock, it is stable when kids are putting on the rings,” says Rebeca. Using smart technology, this high-tech top keeps track of the number of spins while LEDs light up the display. Spin your way to the top score by competing in multiple challenges. Unlock hidden features by spinning the top an exact number of spins to show special animations, or challenge your friend to a high score. “This toy worked on the tripod grip/finger placement needed for writing. Develops finger strength and understanding of balance,” says Emily. 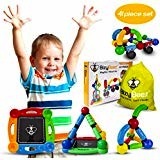 This building blocks set features magnetized sticks and colorful metal balls that can be combined in an endless variety of ways with a simple click. Your child will love exploring the mysteries of magnetic force while imaginatively stacking and connecting sticks (the wheels add even more possibilities). These sturdy, colorful pieces feature four different textures — ideal for kids with sensory processing issues. “Super encouraging for kids with limited fine motor skills. Easy to hold and take apart,” says Felicia. The seamless integration of technology and play allows the dinosaur sounds to be controlled by its movement resulting in a lifelike experience. Place the character in the dinosaur and he comes to life with a roar. Move slowly and hear the prehistoric creature walk through the jungle, move faster and he breaks into a high speed charge. Discover the exciting sounds of the jungle and the dinosaur natural environment, all triggered by different movements and play patterns. 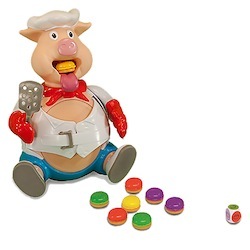 Kids spin the spinner, pop a hamburger into the pig’s mouth and push down on his head. The more they pump, the more his belly grows until . . . pop! Kids love the suspense as they watch his belly grow; the player who makes his belly burst loses the game. “Super fun toy for general arm strengthening and fine motor skills. Also great academically for counting and number skills,” says Kim. Rocktopus comes with 15 musical instrument pods for kids to mix (and remix) and let their creativity flow. Download the free Rocktopus app and let your mini-maestro create their own music videos with their new composing pal. Rocktopus helps kids discover how different instruments sound, explore fun musical facts, and even lets them compose their own tunes. “This is a great toy for music therapy and cause and effect,” says Amanda. Place the seven charms on any of the three magic hearts to see her horn light up and hear colors, objects and phrases. Use the charms to answer quiz questions or add sound effects to create your own special song. 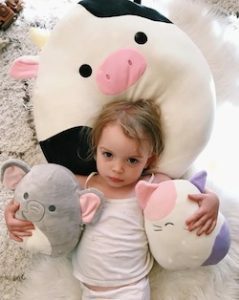 Squeeze the unicorn’s tail to see her beautiful wings flap and hear whimsical phrases and sound effects that encourage imaginative play. “Excellent for kids who are just beginning to play with cause and effect toys. Lots of lights and great music in English and Spanish,” says Rebeca. The super-soft, non-toxic building compound, easily molds and shapes into endless imaginative creations. The touch and feel of Mad Mattr changes with stretching it, squishing it, and building with it. Contains 20 brick building tools, including texture plates, miter boxes, and new curved versions of the Ultimate Brick Maker. Mad Mattr is a great tool for dexterity, sensory play, and more. “Includes a variety of tactile items,” says Kris. The light-up board identifies each of the 50 included coloring pages and responds by showing what color to use in each section. Download more pages online for unlimited printing and play. Connect the light-up dots to draw shapes, objects and animals. 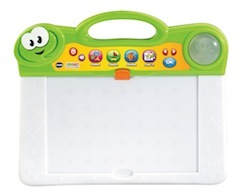 The art board features a dry-erase surface and a stencil card for more creative play, plus a variety of melodies to enjoy while creating your work of art.